Synopsis: In the world of political power-brokers, Sloane takes on the most powerful opponent of her career and will do whatever is required to win. Review: Miss Sloane is a timely political drama that has a stacked deck in its cinematic favor. An Oscar nominated director and multi-award winning actors have been brought together with mostly good, but never great, results. 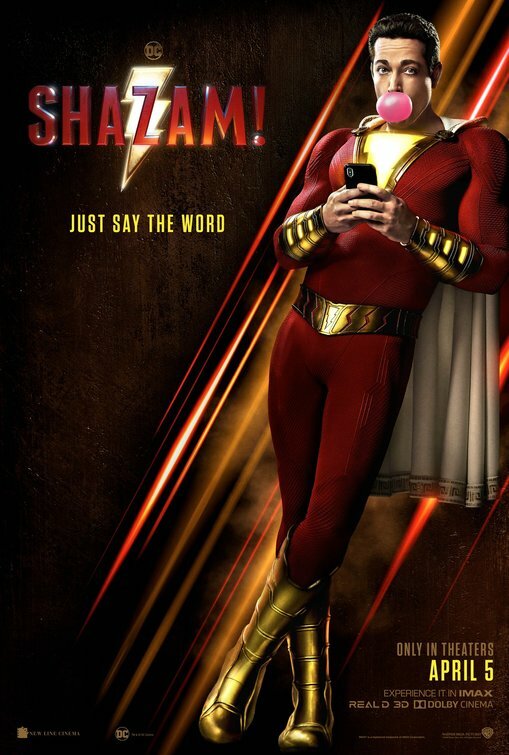 While that may sound like the movie overall is a disappointment considering the pedigree in front of and behind the camera, it has enough energy to rise above the scenes that enervate its forward motion. Jessica Chastain (The Martian) plays the titular character, a sought-after D.C. lobbyist as ruthless in her pursuit of winning as she is about making sure her flame red hair is always tucked neatly behind one ear. (At one point, I doubted she had two ears since we never saw the other). As the film opens, Sloane is about to go before a congressional hearing to defend herself over accusations of impropriety, charges that could, if convicted, carry a lengthy term in prison. Showing how the sleep-averse Sloane got into her current hot seat is what occupies most of the picture, tracing her path from a plum job at a high powered conservative lobbying firm to a grassroots boutique agency opposing a gun bill. The parallels to David and Goliath are evident as Sloane and her recruits take on the big boys who begin to care more about derailing her than they do about pushing through their political agenda. Sloane isn’t afraid to go up against her former employers, even if they already may know exactly what her next unscrupulous move will be. Brief forays into high tech spy surveillance (what’s being done with cockroaches might make a PETA supporter reconsider squashing them on sight) and peeks into the upper pill popping Sloane’s personal affairs via clandestine meetings with a kindly gigolo (Jake Lacy, Love the Coopers) thankfully break up the heavier moments with stale political rhetoric being recited expertly by Chastain and the rest of the cast. The script from first-timer Jonathan Perera is very of the moment, even if it plays like the pilot of a new HBO series. If you listen carefully, the entirety of the twists the film has in store are given away by one character within the first ten minutes but it’s buried so well by Perera that you don’t notice it until you’re walking to your car. Director John Madden (The Best Exotic Marigold Hotel) maneuvers his actors well and keeps the film moving at a nice clip but at 132 minutes there’s probably a good ten to fifteen minutes that could be jettisoned in favor of a tighter running time. While some may accuse the film of cheating in its final act, I’ll again point to Perera outright telling us what’s going to happen and then delivering on it. As much as I like Chastian, I have to say that for the first twenty minutes of Miss Sloane I wasn’t sure what the hell she was doing. Showing a ballbuster temperament on the surface without going very deep, I got worried that Chastain was using this as an exercise in overacting instead of layering in her performance. Eventually, though, the actress tuned in and that’s when the film really starts to zip along. Like the best complex characters, there’s not a lot of backstory given to how Sloane came to be how she is and that makes her one of the more interesting characters to show up in film this year. The race for a Best Actress nomination is a tight one and Chastain might just find herself as one of the five nominees. 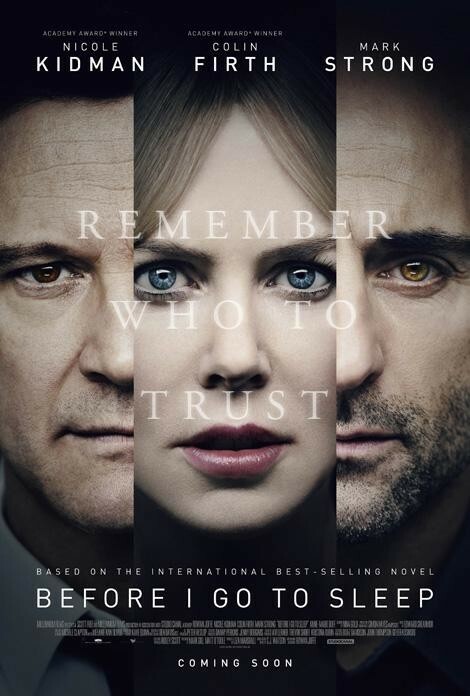 Supporting Chastain is Mark Strong (Zero Dark Thirty) as Sloane’s boss at her new firm and Sam Waterson (The Man in the Moon) as her previous employer who sets his sights on destroying her completely. Waterston may have more hair on his eyebrows than Strong has on his whole body but Strong easily bests Waterston performance-wise by underplaying expertly. You can’t totally fault Waterston, though, because the first half of the film finds many characters shouting at each other…guess no one in Washington knows how to use their inside voices. Though I’m a fan of Michael Stuhlbarg (Doctor Strange), his terribly old-school New Yawhk accent only made me detest his already detestable character more. Gugu Mbatha-Raw (Beauty and the Beast) and moon faced Alison Pill (Hail, Caesar!) are the lone prominent female roles and both are afforded showcasing scenes. As the head of the congressional committee cross examining Sloane, John Lithgow (Interstellar) is his usual blustery self. At the center of Miss Sloane is a debate over gun control that continues to be a hot button issue in this increasingly political climate. Even as a work of fiction, Miss Sloane makes some interesting points about the current state of affairs regarding the NRA and the landscape of big business in our nation’s capital. In setting out to tell this story, Perera and the cast aptly keep the conversation going without letting the movie be solely about that important issue. 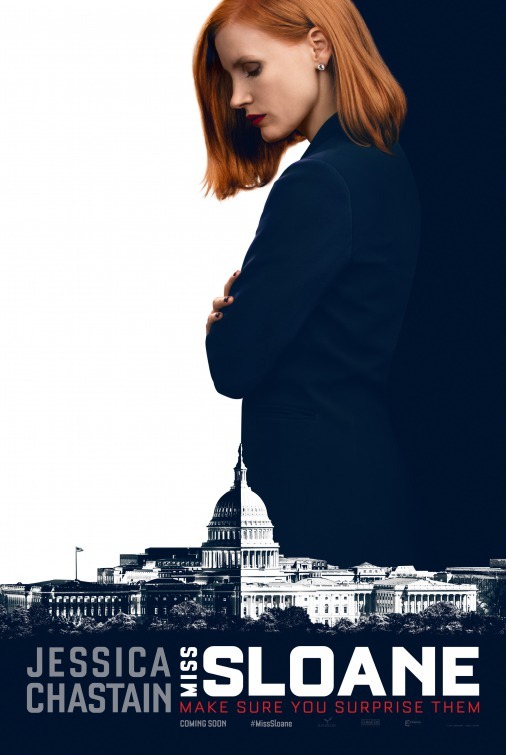 An intelligent, well-read picture, Miss Sloane may be overstuffed and take some time to let its actress find her way but it winds up being a pleasing film with good intentions. If it had been made as the first episode for a cable series, I’d be setting my DVR to record future episodes. 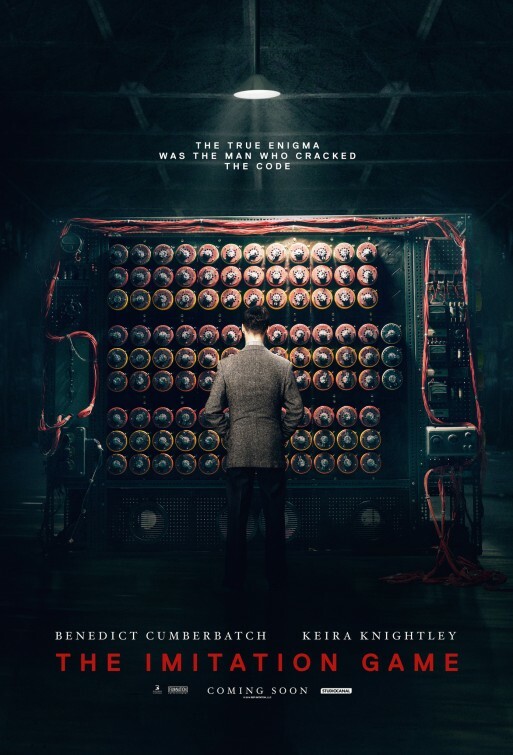 Synopsis: English mathematician and logician, Alan Turing, helps crack the Enigma code during World War II. Review: As I said in my review of the trailer for The Imitation Game, I worry that star Benedict Cumberbatch is getting ever so slightly overexposed. From his on the spectrum performance in the BBC television series Sherlock to his sinewy performances in August: Osage County, Star Trek: Into Darkness, and 12 Years a Slave all the way to his sinister voice work in The Hobbit: The Desolation of Smaug and The Hobbit: The Battle of the Five Armies the actor seems to be everywhere nowadays. With the arrival of The Imitation Game, we should all brace ourselves for more Cumberbatch in the years to come because it’s his performance here that should really put him on the map, not to mention guarantee his first trip to the Academy Awards. Though the character could be a distant cousin to his Sherlock, Cumberbatch’s performance as mathematician turned code-breaker Alan Turing is a fully realized flesh and blood wonder, one not afraid to take aloof to the next level yet still managing to keep an audience engaged. I’m not going to get into the specifics of the film because it’s so multi-layered that you’re better served letting the well-scripted film do the telling for you. Adapted from the Andrew Hodges novel by young screenwriter Graham Moore, The Imitation Game benefits from Moore’s youth in its execution. While the material is never dumbed down, it’s related to us through dialogue from someone that clearly has an ear for how to convey complex code talk and wartime business to the masses. Norwegian director Morten Tyldum (who helmed the bloody good Headhunters) keeps everything moving at a nice clip from the get-go. We meet a post-war Turing being investigated by the police who look back into his life for clues to a current crime. Through these passages we learn of Turings involvement with cracking the Enigma code during WWII along with a group of carefully selected scholars (including Stoker’s Matthew Goode and Downton Abbey’s Allen Leech). From this group a love interest appears (Keira Knightley, Anna Karenina) and instead of feeling shoehorned in, Moore creates a dynamic relationship between Turing and this woman…a relationship that opens up another set of secrets Turing is trying to hide. Straddling the past and present and multiple covert secrets (both kept and uncovered) is no easy game but all involved score high points for its unqualified success. While maybe not an edge-of-your-seat thriller, it’s absolutely one that will command you to lean forward and look harder at what’s underneath it all. An assured film, to be sure. 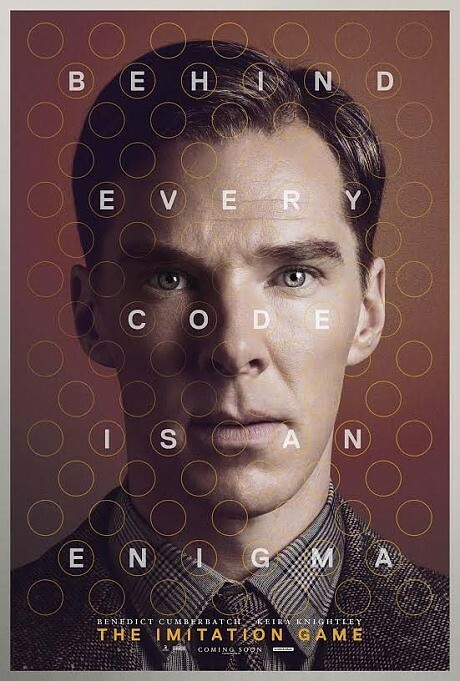 Thoughts: If you’ve had your ear to the awards circuit ground you’d be hearing lots of rumblings about The Imitation Game, a twisty true life thriller that winds through the shadows of code breaking during World War II. I’m a bit worried that star Benedict Cumberbatch (Star Trek: Into Darkness, August: Osage County) is reaching a level of overexposure that could backfire against him in the years to come but for now I’ll give him a pass as he has a way of choosing roles that play to his strengths. Joined by Keira Knightley (having a good year in Begin Again and Laggies) and Matthew Goode (Stoker), it’s apparently a film with the kind of good buzz that needs no code breaker to decipher. Synopsis: A woman wakes up every day, remembering nothing as a result of a traumatic accident in her past. One day, new terrifying truths emerge that force her to question everyone around her. Thoughts: Were it not for co-star Colin Firth dropping out as the voice of the holiday release Paddington, Before I Go to Sleep would be the third movie the actor appeared in with Nicole Kidman in less than a year. After teaming on The Railway Man, Kidman (Stoker) and Firth (Magic in the Moonlight) are featured in this thriller adapted from a novel that feels like the female answer to Memento. As much as I love a good suspense film, too much of the preview hints at the twists and turns in store for audiences, never a good sign for a genre that benefits from genuine surprise. Still…even though she makes some strange choices in projects I can’t help but enjoy Kidman and no one does wide-eyed terror/confusion quite like she does. Synopsis: A chronicle of the decade-long hunt for al-Qaeda terrorist leader Osama bin Laden after the September 2001 attacks, and his death at the hands of the Navy S.E.A.L. Team 6 in May, 2011.
Review: Ever since September 11, 2001 there has been a dark cloud over our country as we continue to rebuild our body, minds, and spirit after the devastating attack on our freedom. Over a decade later, we’re a more aware society, less likely to go through our lives with blinders on having been forced to wake up that real evil does exist in our world. The man responsible for the attacks was public enemy number one, a sign and signal for evil and his death in May of 2011 at the hands of a Navy S.E.A.L. team allowed a small exhale from a country that had been holding its breath for ten years. How this man was killed and how he was located is the subject of Zero Dark Thirty, a film that has arrived with a fair share of controversy and end of the year award recognition. It’s an intelligent movie for adults that asks its audience to snap to attention and come along for a real life manhunt as it teeters between globe-hopping intrigue, government double talk, and questions on the price of justice. The film rests on the very capable shoulders of Chastain (who won a Golden Globe for her work and is nominated for an Oscar and SAG Award as well) as CIA analyst Maya that becomes obsessed with her decade long search for the man known as UBL (Usama bin Laden). Like a bumper car, with every dead end she reaches she changes course without losing sight of what’s at stake. As the years go by and multiple set-backs (some of them deadly) occur, Maya uses considerable intelligence to piece together the puzzle until everything falls into place in a fashion that doesn’t feel too forced or too cinematic to be believable. Oscar winning director Bigelow teams again with her The Hurt Locker collaborator Mark Boal to direct his well researched script with a strong arm. Bigelow has never shied away from making what many would consider “male” films and with Zero Dark Thirty she again doesn’t make the film about gender roles but focuses on the subject at hand. It would have been easy to inject some misogynistic scenes to further burden Maya with not only doing her job but proving she’s worthy of it in the first place. Bigelow keeps the nearly three hour movie trucking along until an outstanding finale shot in near real time as the team of S.E.A.L.’s descended upon the compound where they will eventually eliminate one of the biggest threats ever in the war on terror. I admit I didn’t read too much about this strike on UBL’s compound when it happened so was surprised at some of the details that were new to me. I, like many, assumed that it was a blitz of bullets that was over quickly but the film takes us through every second of these 20 some odd minutes with painstaking tension. Aided by Alexandre Desplat’s eerie music, I’m not sure I breathed much in the final thirty minutes of the movie…it’s hard to say it was “entertaining” but my attention was raptly devout to what Bigelow and cinematographer Greig Fraser put together. The film has taken a lot of hits for its sequences showing the various torture methods used by our intelligence agents to extract information on the location of UBL. To leave these scenes out would be inaccurate and the director herself said it best that “depiction is not endorsement”. Torture happened, we know it did and we all have to have our own internal discussions on how far is too far – to fault the movie for these scenes would be doing a disservice to the story it’s highlighting. Along with Chastain there are strong performances from Clarke (Lawless) and Ehle as colleagues of Maya…both of whom could have easily landed on nomination list in the Best Supporting Oscar category. It’s mostly Chastain’s show and she executes her role with an assurance that never feels false. It’s a restrained, intelligent portrayal of a restrained, intelligent woman that believes in her heart she is the one that must be responsible for finding this man. Zero Dark Thirty refers to the very dark hour before dawn – a metaphor not lost on audiences for the extreme darkness that was felt by many before the man responsible for it was wiped out. It didn’t back bring the lives that were lost on that day or in the war that has been raging on for a decade but, speaking for myself, the elimination of UBL offered a small glimmer of hope that justice had been done. How we came to that point is a very debatable issue but Zero Dark Thirty is a fascinating and involving film that makes the conversation timeless. Synopsis: The Navy SEAL Team 6 tracks down wanted terrorist Osama bin Laden. Thoughts: After becoming the first female ever to win an Academy Award for Best Director, Kathryn Bigelow knew that all eyes would be on her when she selected her next project. With the release of the trailer for Zero Dark Thirty, it looks like Bigelow has stayed close to her Hurt Locker wartime influences with the dramatization of the hunt for Osama Bin Laden. Bigelow has always more than held her own with the big boys so I’d expect nothing less than a gruff, no holds barred examination of the tactical individuals involved whether they be on the ground or behind the scenes. 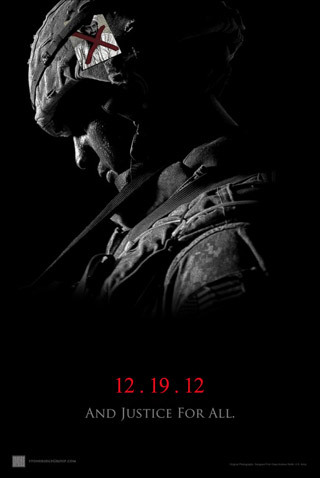 It’s a teaser trailer and count me expertly teased by Zero Dark Thirty.